So who is actually Doogee? If you think that this is a Chinese company, you are right. But Doogee is not an independent company, but is in fact the third brand owned by KVD International Group Limited, a company which was established in 2002. with headquarters in Hong Kong. 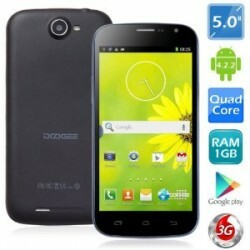 Doogee brand has emerged in year 2013, in response to the rapidly growing mobile market. Our conclusion is as of Doogee Discovery DG500 Dual SIM smartphones we should expect a lot. We already have it in our mind settled into a middle category, and during testing we will see how truly powerful hardware it has and how well Doogee Discovery DG500 Dual SIM behave in the real user environment. Doogee Discovery DG500 Dual SIM is very simple-looking, slightly rounded at the edges, and is similar to many others … and to neither one. Otherwise, its designed by Doogee from Shenzhen and that is logical because most of the products in China are produced there. With regard to its external appearance and size, its lying pretty good in the hand. Doogee Discovery DG500 Dual SIM smartphone boasts a large 5-inch QHD IPS display with a resolution of 960 × 540 (240 ppi). The screen is pretty good and with a very solid light. Below the screen are three capacitive Android keys, while above the screen, is the front camera that has – you will not believe – 5 MP. The front camera is so strong, and now you’re probably asking yourself how strong is the rear camera?! And here’s another pleasant surprise – rear camera has 13 MP. It was not difficult to conclude, that multimedia, photographing and video recording is focus of Doogee Discovery DG500 Dual SIM smartphones. Otherwise, the dimensions are 147.5 x 74.0 x 9.6 millimeters. By edges Doogee Discovery DG500 Dual SIM smartphones are naturally inputs and outputs – the upper side has the microUSB and headphone jack, the right button is for switching on and off, left to increase and decrease volume. In other words – pure classic. Below the back cover, of course, there are two slots for two SIM cards (Dual SIM), and a microSD memory card slot, supports up to 64 GB. The battery is slightly stronger than 2800 mAh so we expect to be durable, as later in the test and it showed. With respect to hardware, in the combined operation the battery is serving more than two days. Otherwise, it is quite difficult to estimate because each user has different habits. 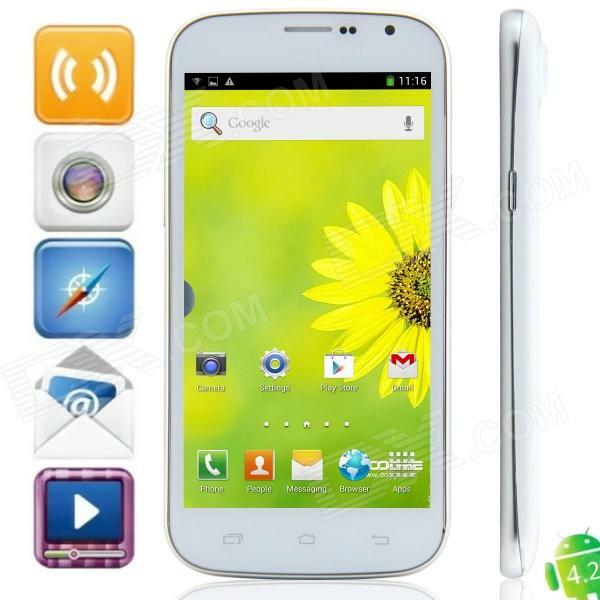 But we can safely say that the battery of Doogee Discovery DG500 Dual SIM smartphone last more than two days, sometimes three. Doogee Discovery DG500 Dual SIM smartphone has a very solid hardware configuration that will satisfy the vast majority of users. The basic operation in Android 4.2.2. operating system has functioned flawlessly, the screens were “flying” from side to side without any problems. It seems to us that the hardware is built strong enough and for serious work, so we quickly concluded that the hardware is pretty well aligned with the operating system. And that’s good. Most of us were interested in camera of 13MP. First we tried the video recording, we expect full HD, but it did not happen. Despite the resolution, the camera captures video in HD resolution (1280 × 720 pixels) but the video we recorded was pretty good. True, we’re a little disappointed in that part, but you know what they say – how much money, so much music. We recorded a handful of photos, we also tried the advanced HDR mode. We shot in resolution 4096 × 3072 dots (ratio 4:3). We decided to use this format, because the ratio of 16:9 is offering images of “only” 6 MP. After spending time with Doogee Discovery DG500 Dual SIM, this smartphone left very positive impressions among us. How is the first time we meet with this brand, honestly we did not even expect too much. Maybe it’s better, we tested it without any prejudice and get what we get, and that is a very solid low-end smartphone. We loved the simple and unobtrusive layout, very solid battery and processor that works very well. Multimedia also works pretty well, you can enjoy music and movies, and video games. But we did not mention another very important thing, and that is – price. The price is between $155 – 175!!! So, it’s maybe the best smartphone at the market if we compare price and what we get. Summary : If you want best buy for the money smartphone then Doogee Discovery DG500 Dual SIM is the right choice. Low price and very good performances will satisfy almost anyone.